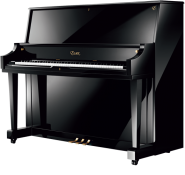 The GP-163 features a duplex scale design – adapted from the famous Steinway & Sons design – which adds richness and tone quality not found in small grand pianos. Preface: These features may also be found on other high-quality instruments, but there is benefit to knowing of their existence. Many features ARE unique to Steinway-Designed pianos, so they need to be understood to be appreciated. Steinway & Sons has spent more than 160 years mastering the art of piano building. Since its founding in Manhattan by Henry Engelhard Steinway in 1853, the company has committed itself to creating the best piano possible. Many of its exclusive patents developed in the early years of operation were groundbreaking innovations that set the standards of modern piano design. Starting in the late 1980’s, Steinway & Sons decided it was time to expand the family of Steinway by developing a new line of mid-priced pianos to meet the needs of piano connoisseurs for whom the price of a Steinway was out of reach. Drawing on Steinway’s deep reservoir of piano knowledge, century-and-a-half-old tradition of innovation, and consistent commitment to excellence, Steinway & Sons designed the all-new Boston piano line. Designing each new piano from scratch, Steinway engineers adapted proven patents, concepts, and materials for the special requirements of high-technology manufacturing. 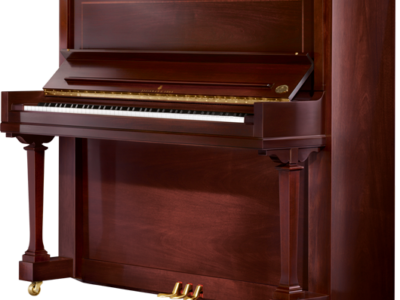 Launched in 1992, Boston pianos continue to be the single best pianos available in the mid-price range, bar none. A feature introduced with the launch of the Boston Performance Edition, a maple inner rim increases structural integrity and improves tone by isolating the sound board. This is because maple is a much harder wood than cheaper substitute woods, such as Lauan, used in other pianos. Harder wood = less vibration of the rim and less absorption of sound = better, fuller sound from the soundboard. A maple inner rim is found in only the finest pianos (e.g., in Steinways). The wide-tail design featured on all Boston grand pianos is a special innovation by Steinway & Sons that creates 6% more surface area in the soundboard. This enriches the sound, giving the pianist the impression of playing on a larger piano. Boston grand pianos are wider at the tail than most pianos of the same length—allowing a larger soundboard area and producing a richer sound. The greater the size of the soundboard, the greater the surface area to produce sound. So a Boston will have a larger and more powerful tone than another piano of a similar length without this feature. The larger soundboard area also allows for better placement of the bass bridge—which yields more volume, greater tone, and a bass that sings. A Boston Performance Edition exclusive! Eleven layers of hard rock maple (used for its superior hardness, grain, and stability properties) are glued in different grain angles of 60 degrees, keeping the tuning pins tight but allowing for fluid motion during tuning. When the pinblock provides multiple orientations of the grain, it grips the pins from multiple directions, creating greater stability for the tuning pins under tension and enabling longer lasting tunings. Radial bracing ties the framework of the piano together and provides support to the rim. Steinway pianos have the same radial bracing. Staggered backposts in uprights mean that Boston has placed the backposts where the tension is greatest, instead of placing them neatly equidistant from each other. Thus, the backposts have been placed for maximum stability—ensuring the piano will last, tunings will be more stable, and the piano tone will be enhanced for all the years of its useful life. High-grade, straight-grained, quarter-sawn spruce is used for its resonant qualities and for its high strength-to-mass ratio. The soundboard is solid and not laminated, which creates the best resonance and projection of sound. In 1936, Steinway patented the diaphragmatic soundboard, which was designed to be thicker in the middle and gently tapered to the edges. The Boston soundboard has tapered thickness from bass to treble. A thinner soundboard in the bass area vibrates more freely. So you get a bigger, richer, fuller tone. Steinway-designed vertically-layered maple with a solid maple cap in all Boston grands, reverse-crowned to match that of the soundboard. The bridges are vertically laminated to provide the best transfer of energy from the bridge to the soundboard. This is most efficient, as sound waves travel with the grain five times faster than across the grain. The cap is solid quarter-sawn maple for strength and durability. Boston ribs, just like Steinway ribs, extend to the full perimeter of the soundboard (as compared to being cut off at the inside of the rim/liner) and fit snugly into the notched rim/liner. This provides for maximum stability of the soundboard and ribs. This ensures no loss of tone or power and eliminates possible rattles and buzzes. Steinway-designed tension scaling results in a longer sustaining tone and longer life of the whole piano. Nickel is used to plate the tuning pins both to prevent rust as well as for its natural beauty. Boston tuning pins are cut, not rolled, which means that the thread is cut into the pins which affords greater holding power and helps to promote longer lasting tunings. Boston plates are vacuum-cast. A Boston 5’10” plate is heavier than a Kawai 5’10” plate—by design. Think of a swing analogy—if a backyard swing set is set up on the lawn without tying the ends down, when the swing gets going really high, the legs tend to lift up. Then think about a swing set at a playground whose legs are in cement. You can swing as high as you want and the legs aren’t going to lift up. The heavier the plate, the less likely anything in the piano that’s attached to it will shift. Long-fiber vacuum-cast iron creates a very dense plate; a dense plate, is better for providing reliable support for string tension and not absorbing energy, which yields a fuller tone. Steinway & Sons’ patented duplex scaling adds harmonic dimension and longer sustain to the tone. When a piano string is set in vibration, partials or overtones are produced simultaneously with the fundamental tone. The quality of sound coming from an excited string can be improved by adding strength to a certain number of these partials. The non-speaking lengths or waste ends of the string have been divided off from the speaking lengths. These separate or divided sections are divided by a duplex scale which will allow the divided parts to vibrate by themselves in harmony with each other. In Steinway and Boston grands, the “front duplex scale assists mechanically in a more rapid subdivision of the usual speaking length into its segmental vibrations, strengthening the harmonic partials. In addition, the rear duplex scale vibrates in sympathy with its corresponding partial tones (in the main portion of the string), thus producing overtones that lend brightness and color to the fundamental tone.” The end result to the listening ear is a fuller, richer, more powerful tone with longer sustain. Even the Boston UP-126E PE and UP-132E PE, like the Steinway uprights, have front duplex scaling built into their pressure bar designs, adding depth to the harmonic richness of the tone of these uprights. Roslau produces the highest quality strings for not only quality but uniformity. Superior strings enable superior tone, so you’re going to have great sound/tone for years of use. Solid copper-wound will last longer than copper-plated on steel, which is why it’s used. It also helps to ensure pure tone for the life of the piano. Steinway-patented overstringing allows maximum speaking length of bass strings and a smoother transition from bass to tenor sections. All Boston grand bass strings are made by the Mapes Piano String Company in Tennessee, USA. Note: this feature is not part of the Silent Salesman display but is important to understand. Piano tone is created when a piano hammer strikes a piano string, causing the string to vibrate, which causes the soundboard to vibrate, which causes the air to vibrate, creating the sound waves that we hear. How effectively the vibration transfer from string to bridge occurs is determined, in part, by how much force the strings apply to the bridge—this force is called “Downbearing.” The downbearing force is determined, in part, by how much the strings bend as they go over the bridges. In order to achieve a full, rich, even tone across the entire piano scale, Steinway & Sons precisely specifies the string bend angle. In all of The Family of Steinway-Designed Pianos, this downbearing angle is carefully established by adjusting the height of the bridge in each section of each instrument. 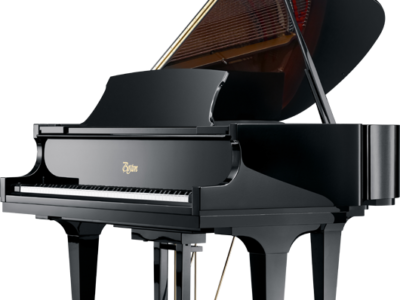 The textured synthetic material used on all Boston pianos (except the UP-118S PE, which has plastic keytops), provides all the benefits of real ivory and ebony without using real ivory or ebony. Spruce is selected for its light and responsive qualities. Each key is one piece of solid spruce with the grain oriented in the direction of the key. This provides the best strength-to-mass ratio. The keyframe has a pressure/pivot point on the balance rail. The keys rotate back and forth on a pin that is anchored in the keyframe. As it takes a lot of wear and tear, it has to be made from a material that will stand up to years of use. Therefore, hardwood is used for durability and to ensure uniformity and longevity of touch over years of use. The keys themselves are made of a softer wood, spruce, selected for its light and responsive qualities. To avoid wear on the keys from occurring, hardwood key buttons are mounted on each key to provide a durable guide for the key as it moves back and forth on the balance rail pin. The keys can take a lot of wear and tear without developing a wobble over time—thereby providing the durability of a consistent touch for years of use. It’s the same design that is used in Steinway pianos. Each one of the 88 keys is individually balanced and weighted, making the key resistance even from note to note and enabling the piano to respond consistently across the entire keyboard. This ensures a superior touch for the pianist and ensures that the piano will respond with nuance and sensitivity to the pianist’s playing. 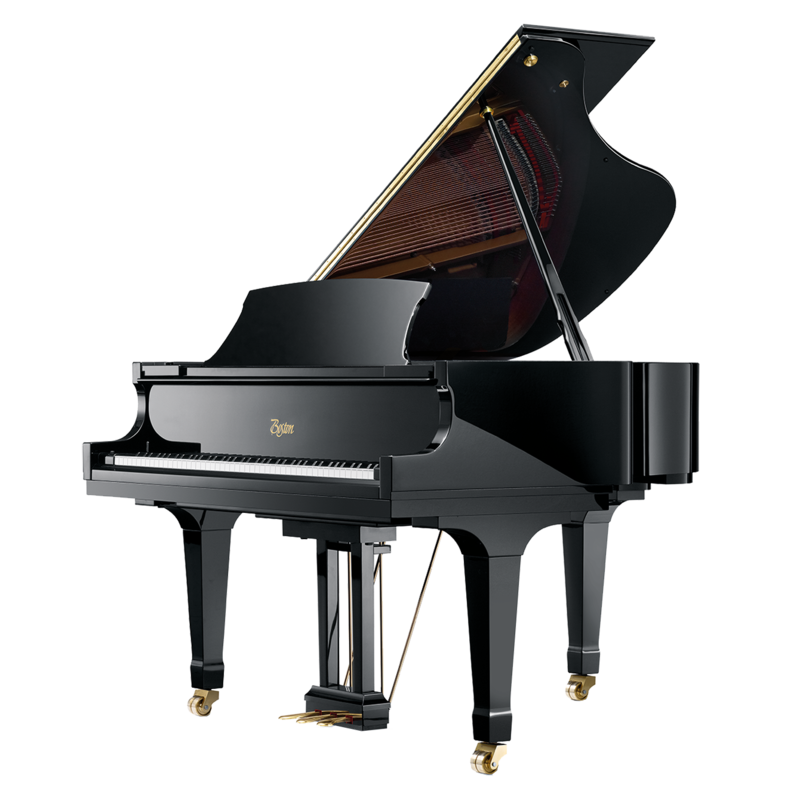 The Boston grand piano action possesses a Steinway-type action geometry, including angled whippen heel for good action feel and good action performance. This ensures that the Boston piano action effectively translates the motion of the fingers to the motion of the hammer. The Boston action is characterized by a faster repetition, better stability, and heightened responsiveness—allowing the musician to play with maximum expression and control. 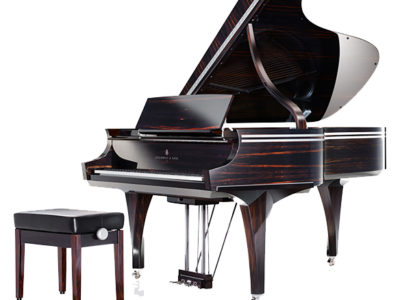 Steinway uses all-wood action parts in its actions, as wood helps determine the characteristic feel. Because of the nature of piano tone, the natural resonance of all parts, including the all-wood action parts, has an ultimate effect on the tone or sound. As in all fine pianos, including Steinways, Boston continues to use all-wood action parts in all Boston actions. The action rail provides a solid termination for hammer flanges, allowing the greatest transfer of energy when playing the piano (which translates into tone). Aluminum is used because it is very durable and is virtually impervious to temperature or humidity changes. It therefore acts as a solid anchor that will last for many years and throughout various climate zones and changes. It has an extruded raised rosette shape down the entire length of the action rail. A rosette shape is cut out of the flange so it can positively mate with the action rail, locking into place, preventing any twisting or shifting of the action parts. The rosette shape ensures a tight fit to keep all action parts in correct and permanent alignment, despite heavy use, humidity, and temperature changes. The rosette shape on the action rail and corresponding flanges has been a Steinway feature since it was originally patented in 1868, and it has been time tested in its ability to provide stability in regulation. Think of a jigsaw puzzle: a piece with sharp and many zigs and zags is tighter than a piece with just one smooth, round nodule. As a point of interest, Young Chang flanges have one groove; Yamaha’s flanges are essentially flat and then the action rail is roughed up a little with sandpaper to help prevent movement. Boston hammers are designed by Steinway. They are made in Japan in a Steinway-owned hammer press that is used exclusively for Boston hammers. There are really only two hammer shapes made: pear and oval. The Steinway-designed pear-shape produces the best tone quality. The amount of area that makes contact with the string is important; you want less attack, more sustain. The reinforced shoulders are on a mahogany molding with underfelt, which helps to create the correct density of hammer felt. The metal fasteners are two-pronged and then twisted to securely fasten the felt to the hammer at the point of manufacture. These three things create a superior hammer that is built to last. Boston uses the same design for its hammershanks as Steinway. The idea behind octagonal hammershanks is to reduce the mass of the hammershank while not compromising the strength of the shank. By shaving off strips of wood down the length of the shank all the way around the shank (like peeling a carrot, making it octagonal) you maintain the structural integrity since it’s being removed along or with the grain of the shank. Therefore, you are reducing the mass of the shank, making it lighter and making the tone more musical and less wooden. The round cut-out on the edge of the toplid and keyslip, called “coving” (like the cove of a shoreline or mountainside), adds elegance to the overall graceful shape of the case. The solid brass will look beautiful and last for years to come (as compared to brass-plated). With the launch of the Boston Performance Edition in 2009, the sheen of the brass hardware was increased from satin to polish. All Boston pianos have a middle pedal. On Boston grands, whatever notes you play while the middle pedal is depressed will remain sustained. Therefore, there is NO repertoire that cannot be played on a Boston grand. On the European-style Boston uprights, the middle pedal is a muffler. On the school-style Boston upright, the middle pedal is for bass sustain. All uprights have a working middle pedal. All grands have a locking top except model GP-156 PE. Only the UP-118S PE has a locking fallboard and toplid in the uprights. You have the built-in security, if you need it. The slow-fall fallboard has been a feature in Boston pianos since 1995. All grands have it, as well as all uprights except the UP-118S PE. Fingers won’t get pinched, and there is greatly reduced risk of damage to the hinges or chips in the finish. Having a metal insert in the keyslip assures that the wood will stay straight and not warp (it will keep the shape of the metal). A straight keyslip will ensure that keys don’t stick and will keep functioning, worry-free. Also, a warped keyslip detracts from the appearance of the piano, as it is quite noticeable. Note: this feature is not part of the Silent Salesman display but is important to understand regarding uprights. The music rest rail was expanded with the Boston Performance Edition to hold more music. A feature introduced with the launch of the Boston Performance Edition, the upper panel opens to allow tone to flow freely out of the case, and it also helps to support sheet music well. Think of this as the upright equivalent of opening the top lid on a grand piano. The Boston piano’s comprehensive 10-year warranty gives you complete confidence in your investment in this piano and provides you with the security of knowing you’re part of the Steinway family. Every Boston is backed by the Steinway Promise. If you decide to trade in your Boston piano for a new Steinway & Sons grand piano at any time within ten years, you will receive a trade-in credit equal to the original purchase price of your Boston piano. Be the first to review “Boston GP-163 PE Baby Grand Piano” Click here to cancel reply.